Shhh! We're Letting You in on a Well-Kept Secret! Ok, we admit that "winter" and "beach" usually don't go hand in hand as the Outer Banks is traditionally known for long summer days of surf, sand and sun. However, give the off-season on the Outer Banks a chance and you'll understand why so many vacationers escape to the coast for a winter getaway. There are unexpected treasures in every Outer Banks town, attractions to visit, shops to explore, wonderful restaurants to experience, and did we mention the low, low off-season rates? Here are Sun Realty's Top 10 Reasons to plan an Outer Banks vacation this winter! 1. Low prices! An Outer Banks vacation home that goes for $7,500 in peak season can be rented for $2,000 in the off-season. You can even find smaller cottages and condos for $600 or less a week! The off-season on the Outer Banks is the time to find a deal. 2. Just imagine cozying up in front of a warm fire while watching the waves roll right outside your window! Many of Sun Realty's Outer Banks rentals offer fireplaces as an amenity. Pour a glass of wine and relax in the warm glow from the fire. 3. So much to do and so much to see! It's true that the Outer Banks used to go into hibernation in the off-season. These days, most Outer Banks attractions extend their season well into the winter. Take time to explore the Outer Banks lighthouses (closed for climbing but the grounds stay open), Roanoke Island, the North Carolina Aquarium, Historic Whalehead in Corolla, and much more. Plus, you'll have no lines or crowds to contend with. 4. Ahhh... There's nothing quite as relaxing as the bubbling water of a hot tub. Many of our vacation homes offer hot tubs that are open year-round. Rent a vacation home with a view of the ocean or the sound and you can take in some gorgeous scenery while you unwind in the soothing water. 5. Get to know the locals! The hard-working folks who live on the Outer Banks enjoy slower schedules in the off-season. Take time to hear the locals' stories about beach life. You'll also get the inside scoop on where to get the best fried soft shells, where the secret fishing spot is, and where to get the best deals on the beach! There are so many fun, colorful, and friendly Outer Banks locals to chat with. 6. 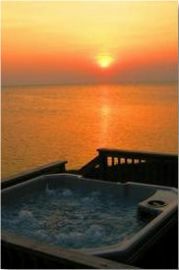 Forget sleeping on grandma's pullout sofa this year - spend Tha nksgiving in style on the Outer Banks! The latest trend in vacationing is to spend the Thanksgiving holiday in a large, luxurious rental home. We offer Outer Banks rental homes with multiple master suites, hot tubs, gourmet kitchens, large dining areas, media rooms, pool tables and more! Get the family together and split the cost this year- prices start as low as $50/person per night! 7. Get your Christmas shopping done at the beach! The Outer Banks offers countless shops, boutiques and galleries where you can find unique gifts for everyone on your list! To really get into the spirit of the season, visit the Christmas Mouse in Nags Head. 8. There are so many fun local holiday events to attend! Take a tour of Historic Whalehead in Corolla, or visit Winter Lights at the Elizabethan Gardens in Manteo; complete with thousands of lights, roasting marshmallows over a fire, and Frosty always playing on the outdoor movie screen. 9. 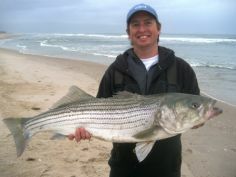 Outer Banks fishing reigns supreme 12 months a year and Rockfish are plentiful during the winter months. Book an exciting charter fishing trip, or go after the abundant schools of rockfish with light tackle from the shore. 10. The beautiful and majestic Atlantic is always the main attraction on the Outer Banks; however, the winter months allow for a different perspective on the breathtaking oceanfront. You can see the natural landscape and the rolling dunes without distraction. You're more likely to find whole shells and colorful sea glass wihle searching the beach for treasures to bring back home with you and a beach to yourself allows you to marvel at the many colors of the sky at sunrise. Take time to relax and unwind - you deserve it. Visit us for an off-season getaway to the Outer Banks. 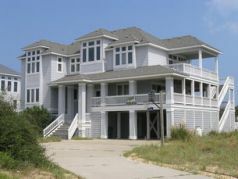 Sun Realty's wide selection of Outer Banks rentals is fantastic, but the low off-season rates are even better!